Blogger Buster: ThemeForest's $25,000 Giveaway - Your chance to get a premium Blogger theme for FREE! 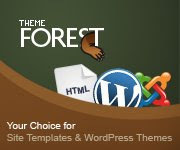 ThemeForest's $25,000 Giveaway - Your chance to get a premium Blogger theme for FREE! As many of you will be aware, I also design premium Blogger templates which are sold through ThemeForest.net: a relatively new site which offers premium quality site and CMS templates. To help promote and raise awareness for the site, Envato are offering a $10 credit to the first 2500 commenters - a total of $25,000! This $10 credit could buy you one of the premium Blogger themes available on the site, or any other of the quality site templates, Photoshop source files or CMS templates available. To qualify for your free $10 credit, simply visit this post over at PSDTuts (also part of the Envato network) and follow the steps. You will need to be a registered member of ThemeForest to qualify for your credit, though it costs nothing to join (ie: you don't need to credit your account in order to become a member).